Here's a compilation of some of my favorite manly products of the past year. 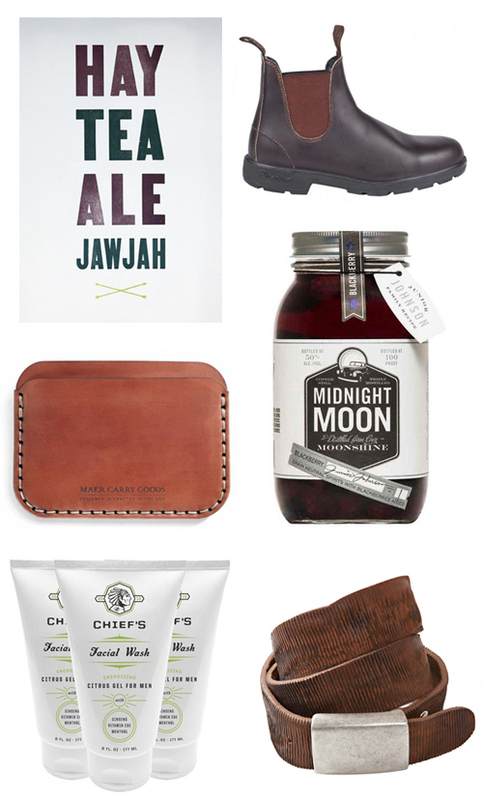 Some are new and some are oldies but goodies... Old Try state prints ($40); Sid Mashburn dark brown boots ($145); Blackberry Moonshine ($20); Moore & Giles belt ($150); Chiefs Energizing Face Wash ($17) Makr round wallet ($240). Best Made Axe ($250); Picker's wallet ($31) Alton Lane Pocket Squares ($35, available in store only); Blue Claw iPad sleeve ($75); Otis James handcrafted tie ($110) *Otis will inscribe the name of tie wearer on the backside of the tie; Moore & Giles slim briefcase ($515); Edisto Oyster Knife ($300). Ledbury gingham cashmere scarf ($155); Bexar Goods waxed canvas bag ($240); Hamilton Gingham shirt ($245); Elijah Craig Bourbon ($25). Witherspoon watch ($130); iPhone wireless handset ($110); Jack Rudy Tonic ($21), Piggy Bank ($125).